We don't know your opinion on the Chevy Metro. 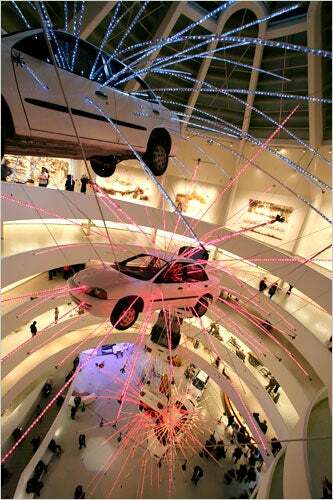 But we can assume that Cai Guo-Qiang is not too fond of the four-door sedan, as he has an art exhibit currently on display at the Guggenheim museum in New York City displaying the gradual exploding of the car. Six Metros have been hung in the famous rotunda of Frank Lloyd Wright's masterpiece. The entire exhibit is intended to simulate the violence of a car bomb, by using lights and careful positioning.